To get started, you will need to pick up a HeroClix Starter Set. Starter Sets come with 6-8 figures, a rulebook, a Powers and Abilities card (PAC), dice and a double-sided map. HeroClix are also sold in Booster Bricks, Fast Forces Packs and Gravity Feeds. Once you have your Starter Set, get to know your characters. HeroClix is played using collectible miniature figures standing on a base with a rotating combat dial. Together the figure, base, and combat dial create the character. 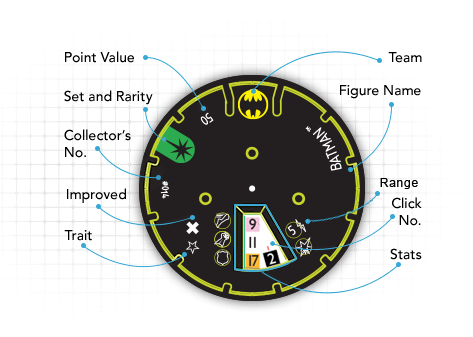 Each character’s base is printed with a set symbol that marks it as part of a particular HeroClix set, and a collector’s number to identify it. The numbers and colors in the window are the combat values and powers of the character. By turning the dial, your character gains new powers and combat values. 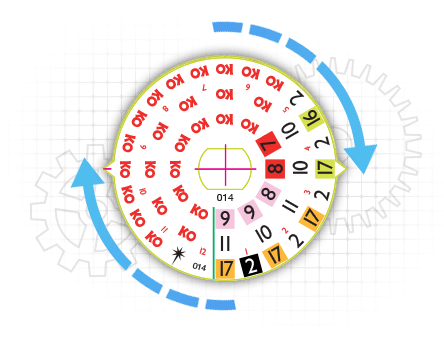 The combat dial is the rotating disk under the character’s base that displays numbers through its stat slot. These numbers are the combat values that indicate how good the character is at accomplishing certain tasks. 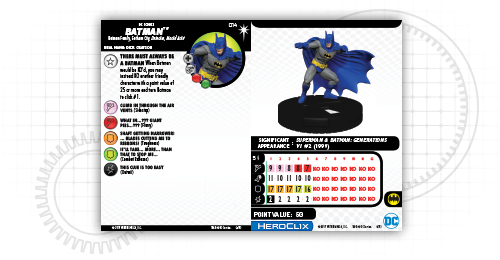 A character card is specific to its HeroClix Character and tells you a bit more about the character and its powers and abilities. Each character has powers represented by the colored boxes on its dial. Each character can only use the powers currently showing on their dial and with each click of the dial, that character’s powers change. Standard powers found in the game are explained in detail on the Powers and Abilities Card that can be downloaded here.